It has been a long year and a half since I first reviewed Graceling and Fire by Kristin Cashore. This week, I finally got around to reading Bitterblue, a sequel to Graceling. Note: Both the summary description itself and my review contain extremely mild spoilers for both Graceling and Fire, since Bitterblue should be read after them. 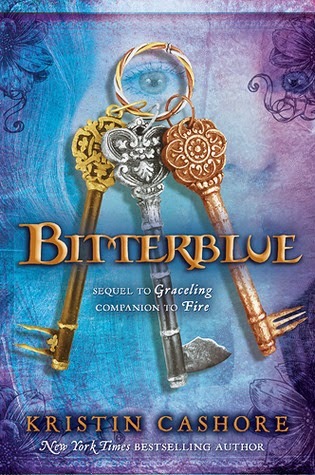 From the author's website: Eight years after Graceling, Bitterblue is queen of a kingdom that was under the spell of a madman for thirty-five years. At eighteen, Bitterblue is still learning how to rule the kingdom. The influence of Leck—a violent psychopath with mind-altering abilities—lives on. When Bitterblue begins sneaking outside the castle to walk the streets of her own city, she meets two thieves who hold a key to the truth of Leck's reign. And one of them, with an extreme skill called a Grace, holds the key to her heart. Based on the Amazon reviews, I was a little apprehensive about reading Bitterblue, but I enjoyed it as much as I enjoyed Graceling and Fire. What I like most about Cashore's writing is her ability to write such complex and distinctive characters, especially the women. Bitterblue is just as brave and intelligent as Katsa and Fire, but in a completely different way. Bitterblue is young and lonely, desperate to improve her kingdom, but overwhelmed by the magnitude of the task. She soon learns that not all is as well in her kingdom as her advisers have insisted. While the plot might not be as active or exciting as the other novels, it is equally intriguing. It is also much darker than the other books, as Bitterblue discovers the extent of her father's evil deeds. Even though I own these three books in paperback, they're so good that I might invest in hardcover copies of all of them. That's how much I love these novels.